Animation got its start in China in 1922, with the Wan brothers’ SHUZHENDONG CHINESE TYPEWRITER, a short advertisement produced for the film department of the Shanghai Commercial Press. Wan Laiming (1900-1997), the Walt Disney of China, his twin brother Wan Guchan (1900-1995), and their younger brother Wan Chaochen (1906-1992) were originally from Nanjing. Their mother encouraged an early interest in the arts, especially puppetry. Laiming joined the Commercial Press in 1919, and his brothers soon joined him there. The Press operated one of the earliest film studios in China, having in 1917 acquired equipment from an American entrepreneur gone bust. Employees of the Press, including the pioneering director Ren Pengnian, were initially trained by a crew from Universal Pictures, which was shooting on location in China in 1919. The Motion Picture Department produced a number of silent short films between 1919 and 1921, and then made China’s first feature film, 1921’s YAN RUISHENG, which was directed by Ren. 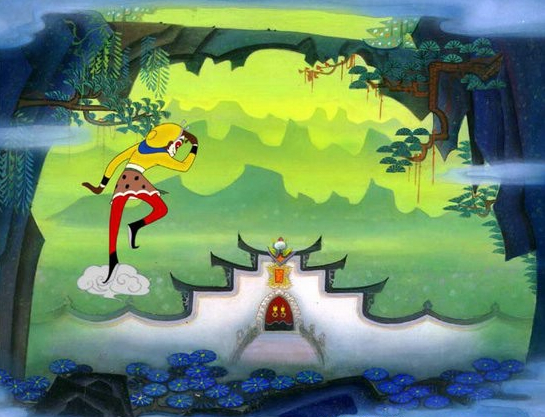 Wan Laiming and his brothers had been experimenting with flip books and zoetrope animations on their own before creating the 1922 short for the Commercial Press. 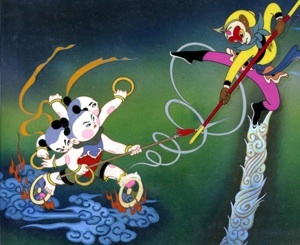 Their original style of film animation is unknown, but by 1926 the brothers were working at the Great Wall Film Company, where they produced the 10 minute long UPROAR IN THE STUDIO. Modeled on Max Fleischer’s OUT OF THE INKWELL, the short combined live action film of an artist with animation of the drawing he is working on. The artist was played by Wan Guchan.